Our society is changing. ‘Us’ is becoming the new ‘me’. Access to products is becoming more important than actually owning them. We are currently in the midst of a transition towards a circular economy in which we need to make more efficient use of everything we already have. We are now looking to share, lend/borrow and exchange anything and everything. Not only consumers can join this movement. Quite frankly, the success of businesses will start to be characterised by the more efficient use of company assets through sharing. Why? Because there are three significant advantages to asset sharing that are hard to pass up: businesses improve their sustainable impact, enhance their social position and reap major financial benefits. Sharing assets can be seen as an integral part of the development towards a more circular economy, in which loops are closed and today’s waste will be the resources of tomorrow. FLOOW2 World’s Reset Button (est. 2012) has been the first company in the world to identify the opportunities of asset-sharing. FLOOW2.com developed an online B2B sharing marketplace that enables companies, (healthcare) organisations, and government agencies to make overcapacity of equipment, waste, materials, services and the knowledge and skills of personnel transparent and tradeable. FLOOW2 is currently operational in 11 languages, and has business partners in Austrialia, the UK, the Netherlands, Belgium, Nigeria, Georgia, China and Scandinavia. The platform has 35.000 users, 30 internal sharing marketplaces and 15.000 advertisements, and thanks to FLOOW2 assets can be shared externally with other companies, within a trusted network of businesses or within an organisation between departments and entities. Sharing assets is so much more than just sharing equipment, resources, and services. It’s a radically innovative new business model that asks for a mind-shift in all layers of an organisation. Once the mind-shift has taken place, sharing assets will bring organisations multiple added values: sustainable, but also financial and social benefits. – Making more efficient use of what we already have – a natural aspect of the circular economy – is often forgotten in the sustainability debate. FLOOW2 seamlessly fills the gap left by reduce/reuse/recycle. – The utilisation of surplus capacity through collaboration and sharing prevents overproduction. Instead of creating and buying new products, companies can now make better use of what’s already on their balance sheet. – Maximising the use of company resources during their life means that raw materials and energy are used more efficiently. 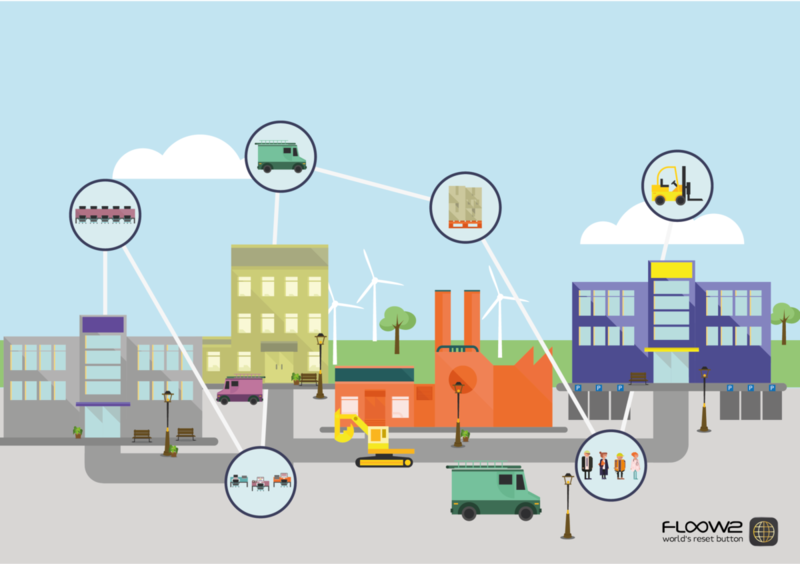 – Local sharing of assets, waste, materials and services, for example on a business park, reduces transport distances which results in less CO2 emissions. – Sharing assets helps organisations in reaching several United Nations Sustainable Development Goals (SDG’s) as well. Namely, number nine, eleven and twelve. One of the key challenges to medium and large companies switching to a model like FLOOW2 (asset sharing) is the mindset and behaviour change required to shift from ownership to access, to start sharing their possessions with unknown companies instead of keep buying new products. Asset sharing is a new business process within most organisations, and requires a different approach to traditional operations and procurement practices. Instead of simply keep buying new products when there is a need for them, employees and especially procurement professionals first need to think about other alternatives, like lending or renting it from colleague companies. And on the other hand, instead of just leaving assets idle or leaving meeting rooms empty, organisations now have the opportunity to sell or rent them out to other companies, with as a result additional turnover. To make the step towards sharing assets a bit easier, FLOOW2 provides existing business communities and organisations with (private) internal sharing marketplaces. On these personalised sharing platforms, they can share all kinds of capacity within their trusted community or between departments and entities within their organisation. We believe that the success of the sharing economy starts with collaboration. That is why we have built our company as a network organisation that expands its business through entrepreneurship. We work together with several business partners around the world, from The United Kingdom, The Netherlands, Belgium and Australia to Nigeria, Georgia and Scandinavia, with whom we develop FLOOW2 as a global sharing marketplace and with whom we have the ambition to make the B2B Sharing Economy into a success.